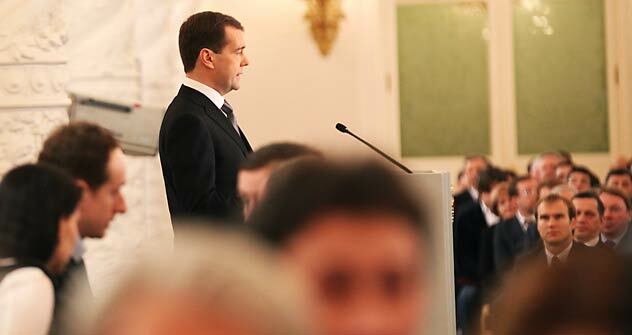 In his last annual speech to the Federal Assembly, Russian President Dmitry Medvedev proposed to reform the system of electing regional governors and return to direct voting, among other political issues. In his last speech as president to Russia's Federal Assembly, Dmitry Medvedev hailed the steps the country has taken to fight corruption and proposed liberal reforms to the country's political system. The results of Russia’s anti-corruption efforts “have seen more than 3,000 Russian officials brought justice over the first six months of 2011,” said Dmitry Medvedev in his last annual presidential address to Russia’s Federal Assembly. However, some watchdog organizations are less optimistic than Medvedev. According to the latest corruption rankings released by Transparency International on Dec. 1, Russia is ranked 143 out of 182 nations worldwide. Medvedev used the successes fighting corruption as a springboard to discuss changes to Russia's political system. Medvedev called for a return to direct election of regional governors, as it will give all politically active citizens the opportunity to make their own choice and encourage them to participate in Russia’s political affairs. “We should give a legal right to all active citizens to participate in the political life,” Medvedev said. The comprehensive political reform of Russia’s political system should embrace not only the election system of local authorities but also political parties. Medvedev wants to simplify the registration process of political parties for elections and allow them to get official registration on the basis of a petition of at least 500 people, which represent at least 50 percent of Russia's regions. He also proposed canceling the rule that requires parliamentary candidates to collect signatures for their candidacy to participate in the State Duma elections to regional legislative agencies. At the same time, presidential candidates would be required to collect fewer signatures to run in elections. Currently, independent candidates have to submit two million signatures from across Russia. Medvedev proposed reducing this number to 300,000. Considering that candidates nominated by parties that are not represented in the parliament, the number could be reduced to 100,000, he said. Combined report based on the information from Russia Today, RIA-Novosti, and Kommersant.